The Cork AUL youths take on the Kerry District League at Turner's Cross on Sunday afternoon (2.00pm) in the opening round of the Snickers FAI Youths Inter-League championship. This competition has produced some thrilling games between the leagues in recent seasons and Sunday's encounter is expected to be close. Both have been training hard and indeed each side has recorded a friendly win. Kerry pipped the Desmond League in terrible conditions while, on the October Bank Holiday, Cork manager Liam McCarthy guided his charges to a satisfactory away victory over the Tipperary and Southern District League. The goals in the 5 - 4 win were netted by Lee (2), Rose, Fitzgerald, and Dekkers. McCarthy, who has a training session arranged for the Mardyke tomorrow, has been busy since the start of the season and has seen many of the league's youth sides in action. Douglas Hall, impressing at U18 level this season, have four players selected. Manager Pat Buckley is doing well with Kilreen Celtic in U17 competitions and they also have four on the twenty one man panel. McCarthy will select from: Kevin Im, Willie Lee, David Bennett, and Gerry Kerins (all Kilreen Celtic); Brian Wilkinson, James O'Leary, Derek Bowen, and Paul Rose (all Douglas Hall); Niall O'Regan, Mick Mehigan, and Danny Lynch (Bandon); Oliver Lynch and Trevor Fitzgerald (Midleton); Killian Lordan and Thomas Dekkers (Ballincollig); Keith Kelleher (Leeds); Darragh O'Neill (Richmond); Alan Whalley (Springfield); Michael McBride (Rockmount); and Derek Peyton (College Corinthians). The winners of Sunday's tie will be at home to either the Clare or Desmond League in round two while the winners of next Tuesday's match between the MSL and Waterford will travel to take on the TSDL or Limerick. One of the Cork v Kerry games took place back in 1989 at St Mary's Park where a certain Roy Keane came on as substitute in a 4 - 1 win for the home side. Roy didn't get on the scoresheet but a Rockmount colleague, Eric Hogan, registered a classy hat trick. Paddy Byrne, the recently appointed treasurer of the Murphy's Stout Cork AUL, began playing football with Richmond Boys where one of his opponents was Johnny Giles, then catching the eye with Stella Maris. Dubliner Paddy went on to play senior league football with St Patrick's, Bluebell United, and Johnson Mooney and O'Brien. Indeed, he played centrehalf with the LSL representative side in a game versus the MSL. Paddy, who moved to Cork in 1975, is married to Dymphna and they have four children. He has worked with BSS for the past 32 years and is a keen golfer, being a member at the Killarney and Lee Valley clubs. He also enjoys the odd swim. He joined Ballincollig as soon as he moved to Cork, beginning 23 years as a member, and played a few years with them. He soon joined the committee as assistant treasurer before going on to become treasurer and eventually chairman (a position he held for 14 years, up to his joining the AUL last season). He is now a vice President at Ballincollig. The Cork AUL youths take on the Clare District League at Midleton on Sunday afternoon (2.00pm) in the second round of the Snickers FAI Youths Inter-League championship. This competition has produced some thrilling games between the leagues in recent seasons and Sunday's encounter should be no exception. The match has been transferred from Turner's Cross and the switch, forced by a decision of the MFA Grounds Committee last Monday that gave the Cross to regular tenants Cork City even though the AUL had it booked well in advance, will cause a good deal of inconvenience and expense to the local league, itself a great supporter of the Curragh Road venue where most if not all its finals are played. Cork have been training hard under manager Liam McCarthy but his plans have been somewhat disrupted by the weather. Cork's first outing was a friendly against the Tipperary and Southern District League where goals by Lee (2), Rose, Fitzgerald, and captain Dekkers, earned the Cork visitors a 5 - 4 win. The opening round of the championship came in November and, at Turner's Cross, the AUL pipped the Kerry District League 3 - 2, the Cork goals by Paul Rose (2) and Fitzgerald (who'll feel quite at home next Sunday afternoon). Clare progressed with a victory over the Desmond League and here there is a line of form as Kerry just pipped the Desmond in a friendly. It looks as if Clare will be very bit as good as Kerry, perhaps even better, and that means a close encounter at Midleton's magnificent grounds in Knockgriffin. Manager McCarthy has made one or two alterations to his panel but will be probably field most of the players that did duty against Kerry. Tramore's Ben Spicer kept a good goal that day. Lee of Kilreen was prominent in midfield while Douglas Hall's Rose was the ace upfront. McCarthy's panel is: Willie Lee, Kevin Im, David Bennett, and Gerry Kerins (all Kilreen Celtic), Paul Rose, Derek Bowen, James O'Leary, and Brian Wilkinson (Douglas Hall), Ben Spicer and Mark Murphy (Tramore Ath. ), Thomas Dekkers and Killian Lordan (Ballincollig), Trevor Fitzgerald, Aidan O'Driscoll, and Oliver Lynch (Midleton), Niall O'Regan (Bandon), Thomas Gettings (Leeside), Michael McBride (Rockmount), Jamie Cotter (Crosshaven), and Keith Kelleher (Leeds). The team bus will depart from St Patrick's Church at 12.15pm on Sunday. * The remaining AUL game in the group stages of the Oscar Traynor Cup against the Red House League will take place in Tallow on January 28th (kick off 2.30pm). Michael Breen who helped out on the line on matchday. David Spratt is overage for next season. this bunch who have been together since their Under 8 days. Between cups and leagues, they have been runners up six times. Stephen Daly, Patrick Clancy, and Fergus O'Donovan. at the Lion's Den, home of their top supporter Bill Flanagan. Charlie Thornhill, Aidan O'Neill, and Darren Kearney. Cork Schoolboys League next season. Sullivan's Quay's well equipped gym. went on to finish third in their league and that gave them promotion to 2A. causing an upset or two in the cups. there. There is one northsider "allowed" and he is Michael O'Sullivan. Kamara is northside or southside. Abdul Kamara, and Christy Meehan. Western Rovers, after a few years of near misses, came good on the double in 1983-84 with triumphs in the league (Tom O'Kelly 2A) and in the Enterprise (nowadays the City) Cup. The league title was the highlight. Here Buttevant took them to a play-off and then a replay. The first game ended scoreless and, two minutes from the end of the Buttevant replay, poacher supreme Frankie McCarthy scored the golden goal to give Western a 1-0 win and the championship. McCarthy, with 28 goals, was the team's leading scorer while Hugh Cooney was next best with 26. Right back Mick McGregor played with the Cork AUL in the Tayto Cup win in Dunlin and, in the following season, John Horan played with Gerry Geaney's Munster team in an inter-provincial against Leinster. Tony Murphy was the manager and he had invaluable help from colleagues Tim O'Neill and Denis O'Driscoll (now with the AUL, MFA and FAI). A goal by Sean Walsh, who later went on to a trophy laden career with Temple United and Greenmount Rangers (he is still involved at the ESB Grounds), put Western trough to the Enterprise Cup final, as it was enough to beat scoreless Ringmahon Rangers. The final opposition was provided by first division Tramore Athletic but this southside derby failed to sizzle and the Rovers scored a surprisingly easy 3-0 victory, their goals by Coughlan, Crowley and McCarthy. The Western Rovers panel that season was: L. Ryan, M. McGregor, B. Nagle, P. Crowley, A. O'Shea, B. O'Donovan (captain), S. Walsh, K. Ruddy, F. McCarthy, G. Coughlan, H. Cooney, J. Punch, N. Tobin, L. McKenzie, J. Horan and J. Geaney. The first eleven listed provided the starting line-up in the Enterprise final. 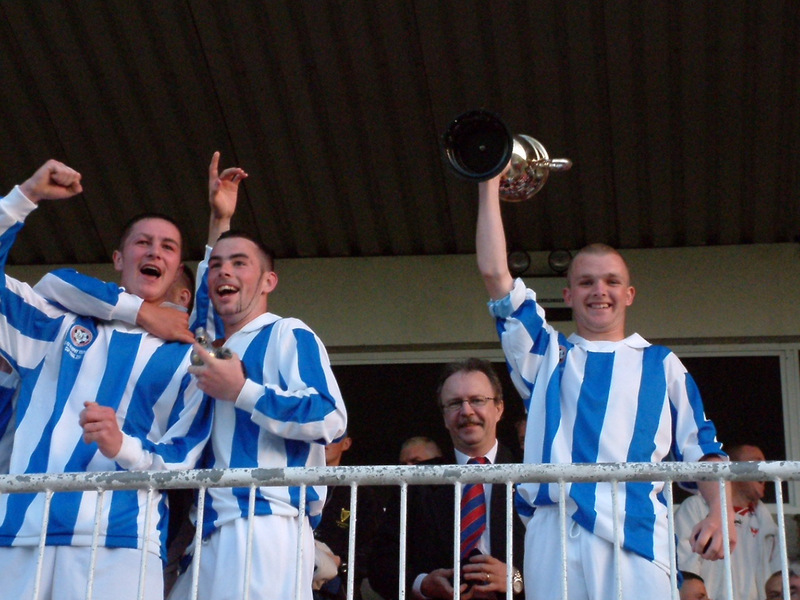 Western Rovers took their place in AUL 1A the following season. There was just one automatic promotion place available and that went to champions Ballinlough Rovers. Ballinlough, who had merged with Victoria Athletic before the season, had an instant reward. Donie O'Leary and Dan Cullinane (later to achieve so much with Hibernians) were the managers; Joe Hegarty was captain and John O'Brien the vice-caption. It seemed that Western's bid for promotion for the second season running had failed. But then came news of a vacancy in the Premier because of the unexpected withdrawal of Cobh Ramblers, a withdrawal that meant 1984/5 was the first season since the founding of the league that Ramblers would not have a team in the AUL. The vacancy triggered a three team play-off and that involved the three first division runners up: Ballyvolane, Waterloo and Western Rovers. Western played Ballyvolane in the semi-final and the southsiders won a good game 2-1. The final though was a bore. "There was more excitement in watching the grass grow at Turner's Cross than in watching the disappointing final" was one comment at the time. Western though weren't too bothered as they won promotion in the penalty kick shootout that followed the scoreless draw. Our picture, taken on August 29th, 1984, shows the Western Rovers, starting their AUL 1A campaign in August 1984. Back row (l to r): Sean Walsh, Pat Crowley, Liam Ryan, Kieran Ruddy, John Horan and Aidan O'Shea. Front: Frank McCarthy, Barry Nagle, Ger Coughlan, Mick McGregor, Bernard O'Donovan and Liam McKenzie. This particular game was against Hibernians, a game that Western deservedly won 3-2, even if one of their goals was hugely controversial. Scores by Liam McKenzie and Pat Crowley had Western 2-1 up against Hibs who had scored through Robert Smyth. Then, much to the amazement of all present, the referee judged that a Sean Walsh shot had crossed the Hibs line. True, the keeper had been beaten all ends up but the ball hit both posts before bouncing back weakly infield. To add fuel to the fire, the next Hibs attack yielded a goal by sub Richard Jordan. It has to be said though that Western, who had Frankie McCarthy twice denied by the bar, deserved the two points. And the good news continued for Western in their next game when they finished strongly to beat Kilreen 3-1. Walsh, McCarthy and Ruddy were in top form for the winners who were one down at the start of the final quarter. Western Rovers were originally founded in 1941 but the unit featured here, based in the Togher and Glasheen areas, was re-formed in 1972 and, by 1981, was regarded as one of the most progressive underage clubs in the city, catering for all ages up to junior in the AUL. Tony Murphy, now the chairman of the Munster Senior League, had been there since the 1972 start and, at the club's annual dinner in 1982, a special presentation was made by the club to Tony in appreciation of the work and dedication shown by the chairman since the re-forming of the club. Western Rovers AUL honours: 1980/1, runners up to Castleview in Youths 2; 82/83, runners up to park Utd in junior 2A; 83/84, won 2A and the Enterprise (City) Cup; 84/85, second to Ballinlough Rovers in 1A, winners of play-off for place in Premier League.